Short Books Showcase | this site is to showcase all of the short books or stories that fascinates readers! Short Books Showcase- a site for books under 400 pages. Each month we will showcase 10 life changing books for our readers. Please help us support these authors by purchasing their books and posting your reviews of these books. Oprah and J.K. Rowling were named two of the richest women on the planet by Forbes Magazine.What do Oprah Winfrey and J.K. Rowling know that you don’t? 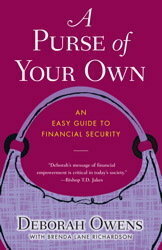 Deborah’s new book “A Purse of Your Own” will share the 7 Wealthy Habits that successful women adopt to build wealth. Published by Simon and Schuster. (ISBN-10: 1416570810) Purchase today. Are you ready to clean out your purse and forge your path to financial freedom 2010? Author and Wealth Coach Deborah Owens is on a mission to empower one million women and she would like for you and a few close friends to be on board. In her new book, A Purse of Your Own, she shares how you can start a Purse Group for support and accountability. It’s easy to get started. Join the Power of the Purse Campaign Today!